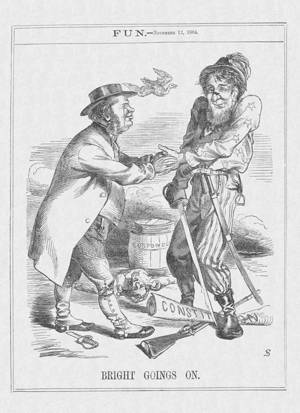 In this cartoon from Fun, a British humor magazine, John Bright shakes hands with President Abraham Lincoln, who appears as a militaristic half-wit stepping on the U.S. Constitution. Bright was a Liberal member of parliament and leading reformer whose Quaker religious beliefs (note his Quaker hat) provoked his intense aversion to slavery. During the American Civil War, he was an outspoken supporter of the Lincoln administration and the Union cause, although his pacifism prevented him from calling for British military intervention on the side of the Union. The fallen man in the cartoon’s background may be Confederate President Jefferson Davis or Uncle Sam.